When adopting a cat, less than a quarter (24%) of people have said they would be likely to consider an older cat aged 11 years or older. This sad statistic has come from a survey carried out by Cats Protection to find out why mature moggies in their care are so often overlooked. 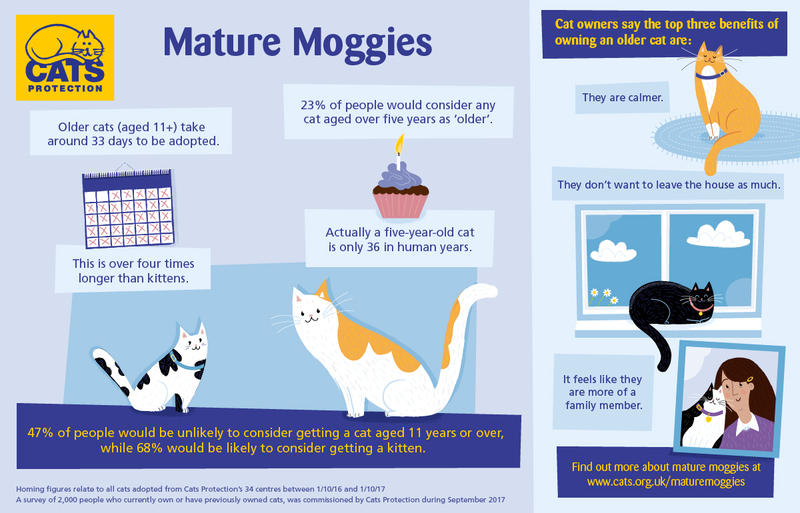 Senior kitizens take four time longer to find a home than their younger counterparts and so Cats Protection has launched Mature Moggies Week (13-17 November) to raise awareness of older cats waiting patiently for new owners. Research carried out by the UK’s leading feline welfare charity found that older cats take an average of 33 days to be adopted, while kittens are typically adopted in just eight days. In a survey, 47% of people said they would be unlikely to consider adopting an older cat, compared to 68% who said they would be likely to consider a kitten. One reason given for being unlikely to adopt a mature moggy was that older cats are not very playful, but many proud cat owners would argue that this is not the case. To find out more about mature moggies, visit the Cats Protection website.